Beautiful sunsets, twisty roads, and smooth pavement (sometimes) are just a few of the things I have enjoyed this riding season. As the cold season moves in here in Philly I have time to plan more epic riding adventures for next season, and look at upgrading my closet. Many of you are also seeing your riding season coming to a close as well, lucky for us, the Dainese Horizon Pants give us something to look forward to… well, on the horizon. 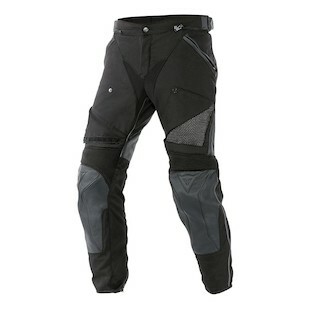 A 2-3 season warm riding pant which uses the DNA from the New Drake Air and the Air Frazer Pants, the Horizon is a textile and leather mix which gives you some of the comfort of textile while protecting you with leather in the higher crash risk zones. This gives you a pant that you can ride more comfortably in without roasting aboard your fire breathing demon. While they are not a waterproof pant there is no need to get worried if you get caught in a little rain since the leather panels are treated to be water resistant and take on anything (this also makes them washable). A more protective pant without needing full leather, the Horizons are an excellent option when taking on the world via two wheels. So check them out, and start putting away those pennies and holiday money to upgrade your closet next year.